We had a little birthday celebration at work this week for someone who A) eats very healthily and B) likes coconut. 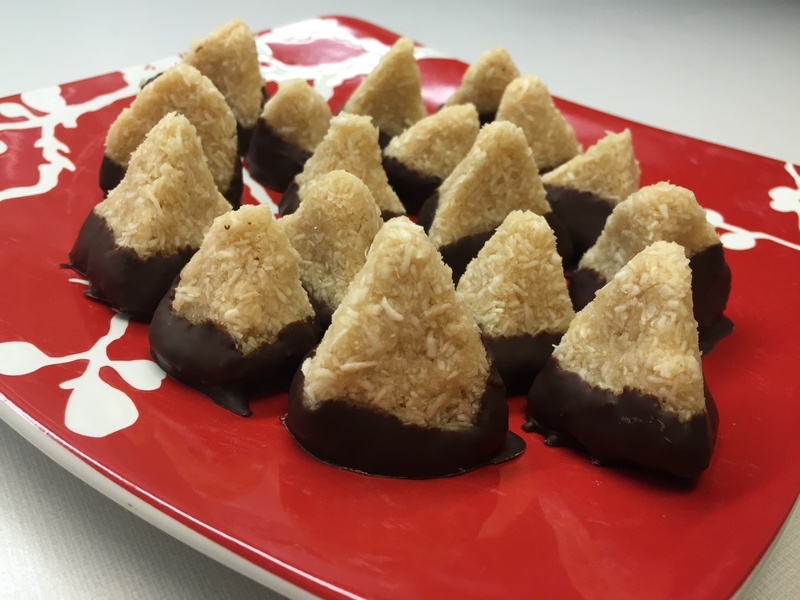 Chocolate Covered Katie’s “Coconut Crack bars” seemed like a good fit for a celebratory treat. The recipe came together easily, mixing everything by hand in a large bowl. But after pressing the mixture into a small pan and chilling for more than an hour, the bars didn’t cut as nicely nor stay together the way I’d hoped. This is probably because I tripled the recipe and didn’t get the proportion of liquids quite right. I salvaged the recipe by breaking the cold bars into tablespoon-sized chunks and forming them into pyramids. Spheres would have been just as good, but I wanted something a little unexpected. I dipped the base of each in some melted dark chocolate and let them set up on a parchment lined baking sheet in the refrigerator. Combine all ingredients in a large bowl and stir until well combined. Press firmly into an 8″ x 8″ baking dish and chill in the refrigerator. Line a baking sheet with parchment paper. Scoop out tablespoon-sized amounts of the coconut mixture, and form into pyramids. Do this by holding the mixture with your thumb, index and middle finger to form three sides, and press the base of the pyramid into your palm to create a flat bottom. You can make straighter edges by pressing each side gently against the parchment lined baking sheet. Once all of the pyramids have been formed and placed on the baking sheet, place the sheet back in the refrigerator or freezer while you melt the chocolate. Pull the baking sheet from the refrigerator when the chocolate is ready. Place a pyramid on the tines of a fork, and dip it into the melted chocolate about 1/3 to 1/2 of the pyramid’s height. Remove excess chocolate by gently scraping the fork against the side of the bowl holding the chocolate, then place the chocolate-dipped pyramid back on the parchment paper. Repeat until all the pyramids have been dipped. Return to the refrigerator until set, then move to a container to be stored in the refrigerator or freezer. These are best served chilled, but still taste great at room temperature.